« Uncle Lu – The pork hock was legit! We often incorporate quinoa into our grain, but we never make quinoa risotto before. 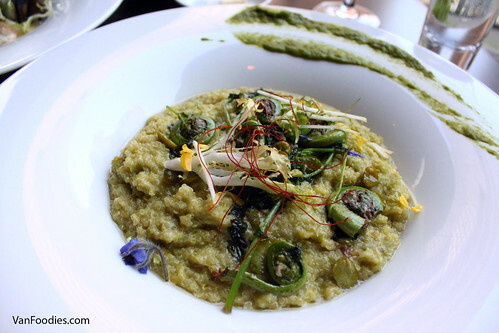 The Green Garlic Quinoa Risotto is the vegetarian entree option, and it was surprisingly good! 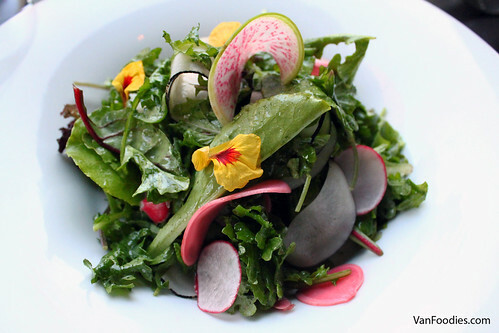 It has used a number of greens including fiddlehead ferns, green peas and watercress. It tasted fresh, but hearty and rich. That was actually a generous serving, which is usually the problem with risotto. But with this dish, maybe I could be convinced to eat more vegetarian dishes haha! The Braised Maple Ridge Farm Veal Cheeks with Stinging Nettle Pasta was definitely our favourite entree. The meat was sooo tender, soft, fatty, with gelatinous bits that were rich and tasty. It was interesting that they used pasta sheet instead of pasta noodles, but I thought it worked fine. 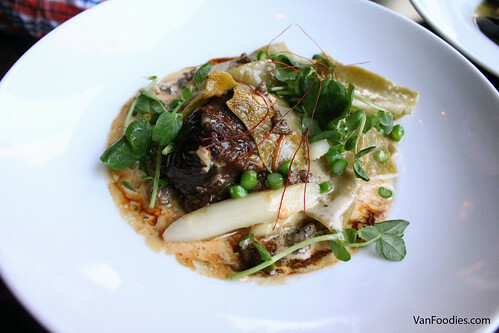 The morel mushroom sauce added an extra layer of richness and earthy tone to the dish. The use of pea shoots and green peas brought freshness to the dish. 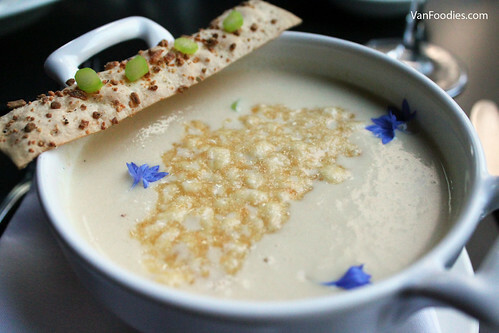 This was a very satisfying dish – I will order it again! 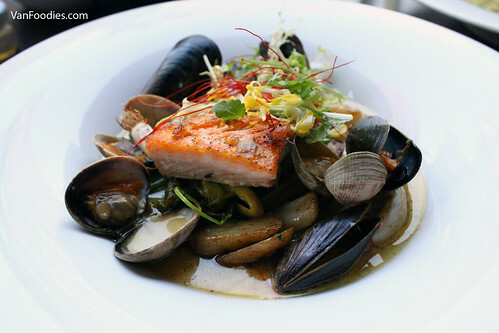 The BC Bouillabaisse with Spring Salmon was Mosaic’s take on this classic seafood stew. The salmon was nicely seared; meat was moist, flaky, with crust on one end. There was a good amount of clams and mussels; it’s unfortunate that the mussels weren’t quite in season so they’re not plump and juicy. When the Bouillabaisse was brought to our table, the broth was actually missing, so we got an extra episode of pouring hot broth onto our plate. For dessert, we were in for a treat. First, the Maple Espresso Creme Brulee was creamy, with prominent espresso flavour. It was a good size dessert so there was plenty to share. 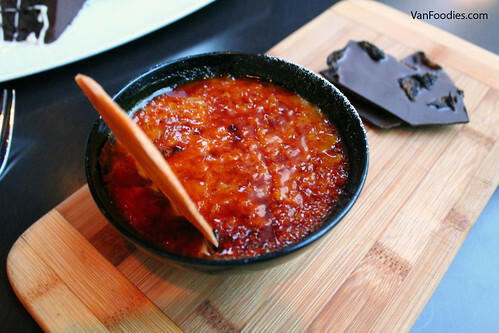 I liked the complex flavour in the maple brulee crust vs. the regular sugar crust. The dark chocolate bark had some dried fig pieces and I thought it was a nice combination. The Mosaic’s Signature Triple Layer Cake was just of ridiculous size! 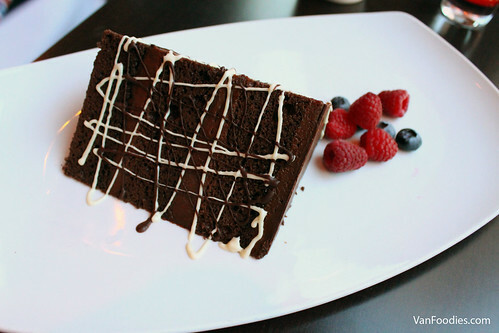 If you’ve had it before, you know it’s rich, decadent, and it will satisfy all your chocolate craving. It may work even better with a dollop of fresh/whipped cream. By the way, this was only half of its regular size, and I heard that if it’s your birthday, you’ll get one of those all to yourself when you dine there. Overall it was a very satisfying meal and we walked away with a big smile on our face. 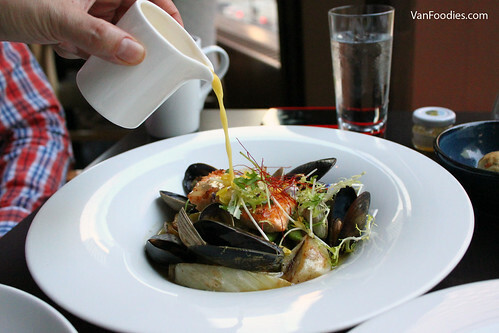 For $27, the #SpringFling package a great deal for a 3-course dinner at a fine dining, hotel restaurant. I think it would make an awesome dinner date. Mr. recommends getting Bisque + Braised Veal Cheeks + Chocolate Cake. I prefer Salad + Braised Veal Cheeks + Creme Brulee. I learned that this will be the last VANEATS.ca package before evolving their website, so take advantage of this deal while you can! I’ll definitely miss their package offerings but I wish them all the best with the new direction.